Let’s see if I can help with that. The character’s expessions on theis page are first-rate. Thali’s suspicious stare, and Shadow’s glare, are particularly impressive. I also sheepishly admit to finding the humor in the dialog. Under normal circumstance, a man telling a woman “You claimed my heart” would be an occasion for warm fuzzies,or at least a painfully hard heart-thump. With these two, not so much. Oh, and I love the arcane-looking font when Shadow shushes Thali in the last panel. On another note, something you really need to do for the site is to get a TWC voting button back up. I’ve been trying to keep you at least dimly visible on the list, but they somehow screwed the Favorites voting page up so badly, I can’t always get through to vote. The individual site button still works just fine–assuming there is one. Hopefully this will become even more important in the not-too-distant future, but for right now having a reliable way to vote would make me feel better. Haha, that definitely does improve my mood! The strangeness of such usually intimate words being mundane (or, in Shadow’s case, being the cause of exasperation/frustration) was actually one of the “seed ideas” for the whole comic. 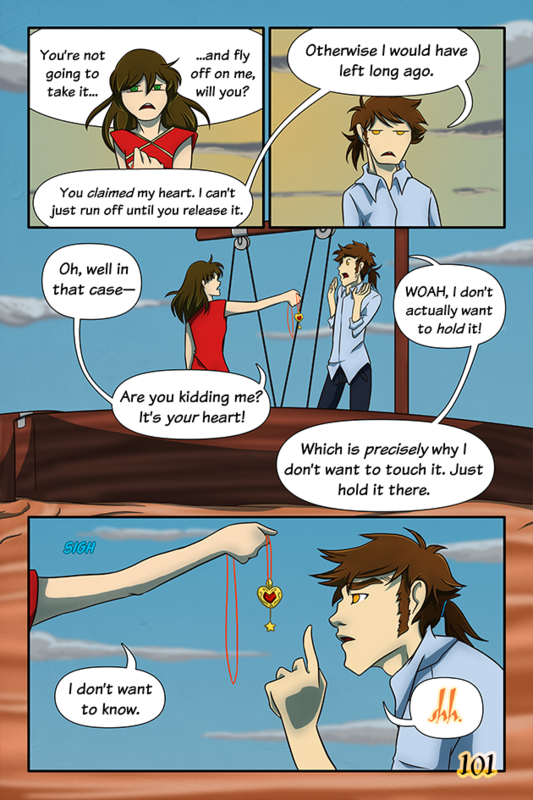 “Holding one’s heart captive” suddenly takes a whole new meaning, being “heartless’ becomes literal… and what other ordinary expressions mean something new now? What could “wearing your heart on your sleeve” mean? Or having a “broken heart”? So you can look forward to more ordinary expressions being turned on their head in the future. Oh, the button would be more for the benefit of those who aren’t as stubborn and determined as I am. And for your benefit as recipient, too, of course.